spiral bound, packaged and sent to the person or persons of your choice. This battle is won, one person at a time. Click on the button to enter address(s). There is increasing awareness of ME/CFS in children and adolescents. It is more common in children over 10 than in younger children, though it can affect children as young as 5. 13% of youth who get Infectious Mononucleosis go on to develop ME/CFS. This illness commonly persists for many years. There is no known cure. Because it is not well known or understood by most doctors, it is thought that over 80% of people with ME/CFS are undiagnosed or misdiagnosed. 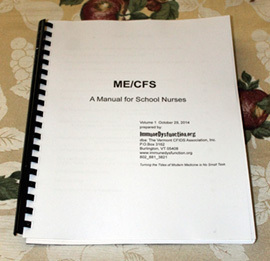 ImmuneDysfunction.org has developed a 98 page manual specifically for school nurses. The manual will help to identify this serious illness among a student population. While there is no known cure, we CAN establish a recovery protocol and prevent worsening. Our goal is to foster awareness among school nurses. In turn, when cases are discovered, we can avert the misdiagnoses and prevent a lifetime of disease. It is immensely difficult for adults to grasp even a rudimentary knowledge of this disease and a task that is multiplied tenfold when it affects children. Please share this with your friends and professional associates. This will have a Manual for School Nurses sent with a cover letter either to a nurse in the State of Vermont or to the School Nurse of your choice. 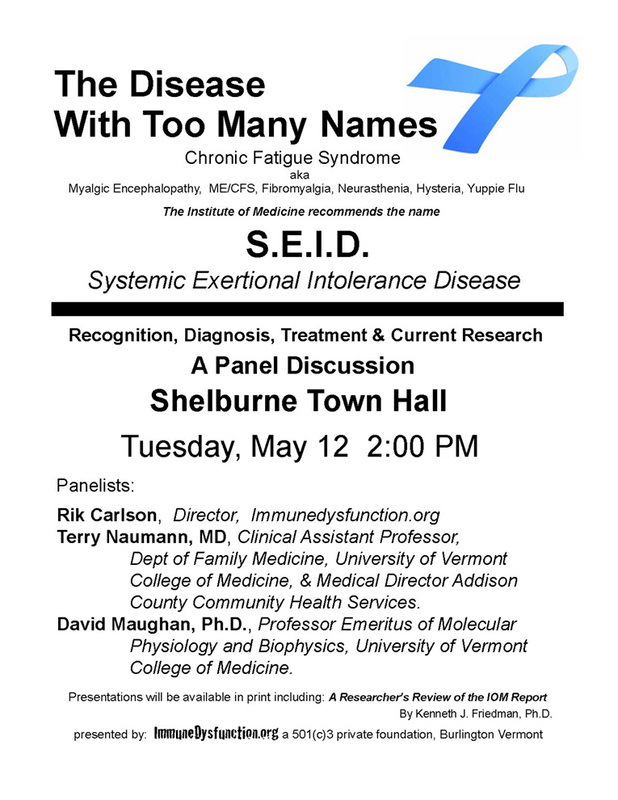 Facilitate the education of patients, families, healthcare providers and primary care physicians in order to validate and establish a recognized and acceptable protocol for the diagnosis and treatment of Myalgic Encephalomylitis/Chronic Fatigue Syndrome (ME/CFS). Our activities include a medical scholarship program at the University of Vermont, an active website, attorney referrals, dissemination of information with audio and video materials, a book, and a 60 minute documentary film. The ABC’s of CFS by Kenneth J. Friedman, Ph.D. Adolescents with ME/CFS in the School Setting by Barbara B. Comerford, Esq. One Families Nightmare by Mary O’Connor Prologue by Charles W. Lapp, M.D. Tips for Classroom Teachers of Young People with CFIDS By Kate Anderson, M.Ed.